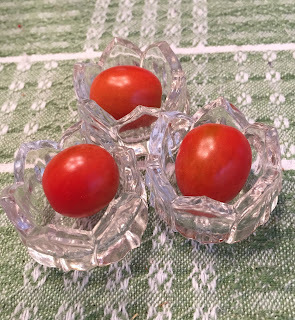 I do believe my grandmother's antique salt cellars are the perfect little dishes to display some of the first cherry tomatoes of the season. This display of cherry tomatoes lasted as long as it took to take the picture. Then I ate the tomatoes and put the salt cellars back in the cabinet. They were quite good and ripened earlier than the other cherry tomato varieties in my garden, which are all still green with no hint of red on them. I'm sure right now the green cherry tomatoes on the other plants are rolling their eyes, if they have eyes, at these early ripening tomatoes. They are thinking "show offs", assuming they can think. They are probably thinking these early ripening cherry tomatoes are like the kid in class who always has his or her hand up volunteering to help the teacher, just to impress the teacher. These tomatoes are so good, I think they would surely help little old ladies cross the street, if they could. In fact, I think these little cherry tomatoes might even try to weed for me, they are that good. Oh, wait. I might be going a bit overboard. The first ripe tomatoes sometimes make me do that, even if they are just cherry tomatoes. I should calm down a bit. After all, what if the other tomatoes sulk because of all the attention I'm giving these early cherry tomatoes. What if they decide to just stay green instead of trying to catch up with them? What if this is it for tomatoes for me for this season? Are these cherry tomatoes enough tomato for the summer? No, but they are quite good. These early ripening cherry tomatoes are the variety, 'Fantastico F1', an All-American Selection from 2014. So far, this variety is performing as advertised, ripening earlier than other varieties. We shall see if it lives up to its other claims, of being resistant to late blight and the fruit not cracking open if left on the vine after it is ripe. Though, with no other tomatoes ripening right now, there is little chance of me leaving these on the vine any longer than necessary. I ate the first six last night and these three tonight. I am hoping there are more ripe tomatoes tomorrow and for several days after that. Based on my records from previous years, these 'Fantastico F1' tomatoes will be all I have to pick for several more weeks. I do want you all to know that last fall my name got pulled out in a drawing to get some sample plants from All-American Selections, and this was one of the plants they shipped me this spring. I planted it in the garden with my other tomatoes, but wish now I had planted it in a container on the patio because it is supposed to be a good variety for containers. Next year, I'll do that. Next year, remind me to get 'Fantastico F1' tomatoes to plant in a container on the patio. And remind me to calm down when they ripen early, but I still will display them in my grandmother's antique salt cellars. It's a new tradition for me to do that now with the first ripe cherry tomato. Then, come back in mid-July to see what traditions I follow when I pick the first ripe Big Tomato of the season. You won't be disappointed, I promise. You make me want to grow them! I bought two cherry tomato plants for containers and have a lovely crop of green tomatoes. I never even thought to look at the tag to see how many days to maturity which I always do for regular tomatoes. A fun reminder that I grew up with salt cellars at my grandmothers. I don't think she even had a salt shaker. My kids and grandkids have no idea what it is. My cherry tomatoes have a good bunch of green tomatoes. A few are beginning to ripen.